Hearing is one of our most important senses. It helps us to communicate with our loved ones, can alert us to potential dangers and allows us to listen to beautiful music. All of this is made possible by the intricate mechanical process of our ears. Ears are extraordinary organs. They can pick up sounds from all around you and turn them into messages that your brain can understand. How clearly these messages are received depends on how well our ears work. What makes up the ear? The outer ear collects sounds and sends them through the ear canal to the ear drum. The ear drum vibrates, moving three tiny bones in the middle ear back and forth. These vibrations cause fluid in the inner ear to move which triggers a response in the hearing nerve. 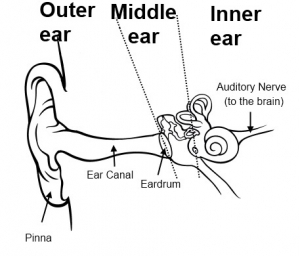 The hearing nerve sends a message to the brain to be interpreted as sound. Hearing loss, or hearing impairment, happens when there is a problem with one or more parts of the ear. Someone who has hearing loss might be able to hear some sounds or nothing at all.It can be caused by many factors, including noise exposure, illness, some medications, physical trauma, genetics or age. If you think you may be experiencing a form of hearing loss,book a hearing test with our specialists at Total Health and Hearing Morningside.